This is the second installment about cars, focusing on the all-pervading car culture of the 1950s as I remember it. The photos are gathered from my family’s albums and just “happen” to include me in every one. Sorry about that! How about balancing it out by sending in your car stories and photos? 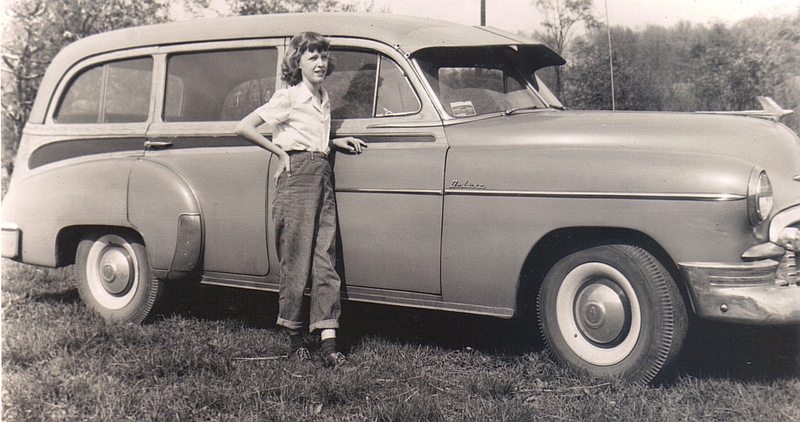 Ann Angel, age 11, with family car, a 1950 Chevrolet DeLuxe Station Wagon. The diaries of my youth are filled with references to cars, from the early days when our family would take the car out on the two-lane country roads or through Buhl Park just for the enjoyment of the ride and the scenery…to a very long family trip in our 1950 Chevy station wagon across the United States and into Mexico…to my teen years when each boy was primarily described by the make and year of the car he was driving. I recorded the many times our dates with guys were interrupted when the car – usually a junker – would break down and we girls spent part of the evening waiting while the guys poked and prodded the engine trying to get it going again. The cars then were much less complicated in design and most guys knew automotive basics. Having “wheels,” usually family cars borrowed from our parents for the evening, enabled us to hang out at places in Sharon and Hickory (now Hermitage) and even travel across the border into Ohio (where the drinking age was lower). They were frequented hangouts where we could see who’s out and about and others could see us. They included Hickory Fine Foods for pizza, Deneen’s Dairy Store, Twin Kiss Drive-In or Dairy Queen for ice cream, Town & Country Drive-in Restaurant, Thornton Hall for bowling, roller-skating, and record hops. And of course, there was Reynolds Drive-In Theatre, which had an entry price of 50 cents a car and sometimes featured live musical entertainment during “intermission” on the roof of the refreshment stand. Ann Angel with the family truck nicknamed “Liza Jane” (Dodge 1950), Second Street, Sharpsville, PA, January, 1958. Ann Angel in H.S. graduation outfit, with the family’s 1953 Lincoln Capri. Main Street, Sharpsville, PA, May 1958. Ann Angel with 1960 Corvette on a visit to sand dunes in Michigan in 1962. Click on photo for larger image. Press Escape key to return. Our high school did provide driver’s education, which I appreciated because I dreaded learning sessions with my dad, who had little patience if you made the wrong move. I remember that several of us students would alternate as passengers or drivers while the teacher sat in the right front seat with his own foot brake in case it was needed in an emergency. Meanwhile, the teacher would insist on playing what we considered “square” music on Sharon’s WPIC radio station when we would have preferred rock’n’ roll on Youngstown’s WKBN. Cars meant a lot to us: Even though our cars were often borrowed or beat-up “buckets of bolts,” we savored the momentary feelings of freedom from routine life, rebellion against supervision and the importance as a distinct group that teenagers were seeking in the 1950s. Hey, what about Santa coming to each home in Sharpsville at Christmas???? Oh, had to turn on the porch light…. Yes, a story about that delightful Sharpsville tradition will be coming soon! Watch for it!